Superb line-up of off-road machines at the Perce Simon Reunion. Almost 120 former mudpluggers gathered at the Ibsley village hall for the annual Perce Simon trial reunion on September 4. 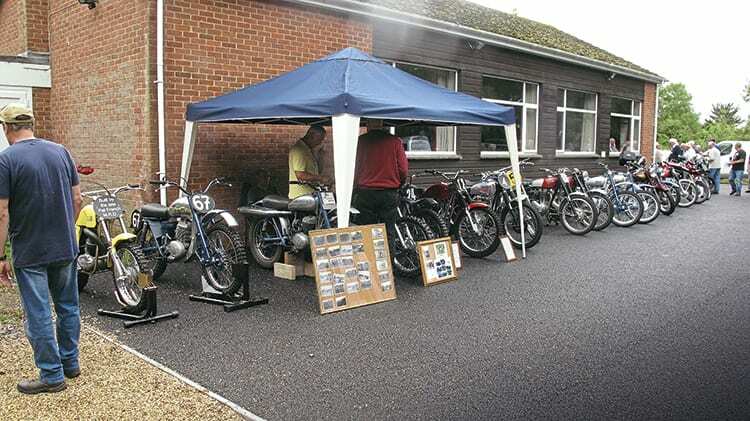 Gleaming in the sunshine was a superb collection of off road bikes from the 1960s, while inside enjoying tea and cake was a ‘who’s who’ of feet-up stars from the golden era. Don and Derek Rickman, Jeff Smith – who won the trial five times out of six rides – George Greenland, Triss Sharp, Bill Faulkner and Greeves stalwart Mike Jackson, along with five top lady riders, all exchanged memories from what is regarded as one of the UK’s best national trials. Previous Post:1000 Bikes roaring back!